A professional and personalised service. All our gates are bespoke, custom made, to your exact specification. They don’t come in a standard size, they are made to the exact size and design that you want, you won’t have to compromise on style. From the basic 5 bar gate to a more detailed style of gate, from traditional to modern, our gates are made to your exact specification. Whether you want it simple and understated or a more elaborate style that reflects your personality, we can help you through the design process ensuring that you get a gate that you really want. With a vast knowledge of the different woods and veneers available, from the type of hinges and locks, Woodbees can help you to plan how your project will look when finished. 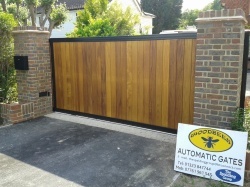 From the very outset Woodbees care about your requirements and will work closely with you to make sure that you get what it is that you want, from the initial site visit to the final completion and commissioning of your gate. You will have one point of contact and all works are carried out in house, from the initial free no obligation site survey to any ground works needed, to the final installation and commissioning of your gate. We do not offer an off the shelf price with standard sizes, all our gates are individually priced to meet a customer’s exact requirements.